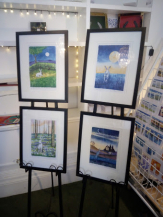 Four White Hares to celebrate Spring, Summer, Autumn and Winter. 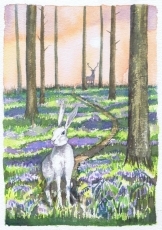 Digitally printed, framed and signed. Presented in textured white double mounts in matt black lacquered frames that measure 42cmx32cm to the outer edge of the moulding. Pronounced Sah-vain this is named after the tradition celebration for Halloween which was not creepy like today's jokey occasion but a wonderful celelbration of those that had gone before and passed on to the 'Summerlands'. Lanterns were lit and stories told; you can make up your own story for this image. 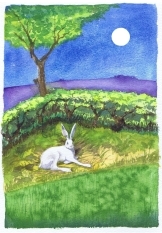 This painting depicts the Irish tradition of leaving one corner of a field uncultivated to allow the hare space and shelter away from agricultural processes and the danger of the harvest to come. 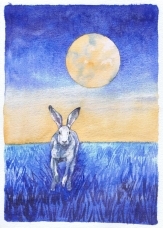 The hare is associated with the moon throughout history and world cultures. 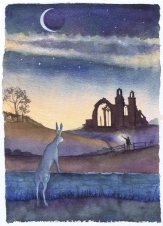 One origin of this connection could be that hares graze at night in open fields. As their defence is to run they stay in the open in order to see any threat well before it arrives.